Types of Harp Pins — Rees Harps Inc.
A description of the types of pins used on lever harps including tapered harp tuning pins, piano/zither pins and bridge pins. Lever harps are often also called Irish harps or Celtic harps. We are also the makers of Harpsicle® Harps. Rees has been building harps since 1972. Our harps are hand crafted in Rising Sun, Indiana, United States. On the neck of any lever harp there are a two types of pins, tuning pins and bridge pins. It is useful to understand the function and variations in each pin. Tuning Pins are just what they sound like They are the pin around which a string wraps and around which a tuning wrench can be placed so that a string can be adjusted into the correct pitch. There are two kinds of tuning pins used in modern lever harps: classic harp tuning pins and the micro-threaded piano/zither tuning pins. Bridge pins are found on all harps with levers and are necessary to make levers work accurately. Tapered Harp Tuning Pins are a cylindrical wedge shape which is set in all the way through the arch. The string wraps on the left side and the end of the Pin machined for the tuning wrench is on the right side. This is the traditional pin for lever harps. At Rees we use threaded tapered harp tuning pins on our Morgan Meghan, Shaylee Meadows, Mariposa and Aberdeen Meadows Rees Concert Line Harps. Micro-threaded piano/zither pins (the silver colored pins shown above with the string wrapped around them) are much smaller than either of the other style of harp tuning pins. These pins do not go all the way through the arch and can only be seen on the left side of the harp. Micro-threaded pins have the same advantage as threaded harp tuning pins in that the micro-threads reduce pin slip. The further benefits of this much smaller pin are that it removes less wood from the vulnerable arch of the harp, which is especially important on smaller harps, and the pins are both much lighter and much less expensive. These latter two characteristics are important to those who are prioritizing either the final cost of the instrument or the overall weight. The one thing to remember about a zither pin is that when changing a string the pin needs to be backed out by three full turns so that it does not end up being turned too far into the arch of the harp. There is an opinion in the harp community that micro-thread zither pins are somehow an inferior pin. 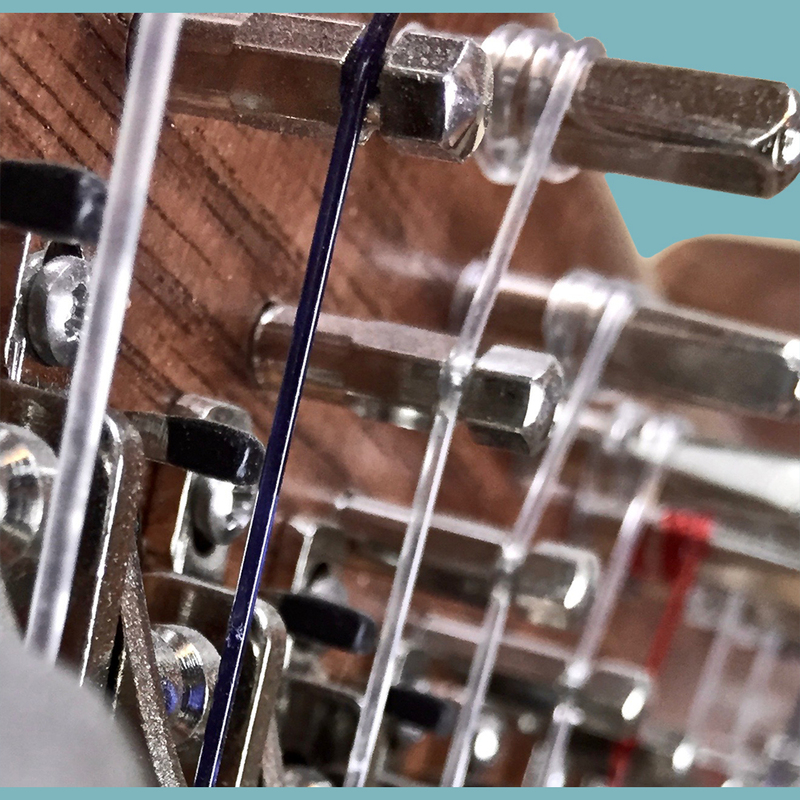 Our lutherie builds our Harpsicle® Harp line and some of our Rees double harps and our Morgan Meadows Rees Concert Line Harp with micro-threaded pins. Piano makers, who build instruments which endure under much greater string tension than even harps, laugh at the idea that a tapered pin might be a better mechanical solution. A $60,000 Steinway is made with micro-thread pins. The installation of zither pins removes much less wood from the neck of the harp and the friction propagated by a micro-thread is inherently more mechanically stable than that of a wedge drastically reducing the splitting force on the harmonic arch. When installed correctly on a harp, micro-thread pins rarely strip-out and they are also less expensive. If the type of micro-thread pins available today were available during the historically traditional periods for harps, it is doubtful tapered pins would ever have been used. Though modern playing techniques have evolved around the tapered pin, they could just as easily have arisen around a micro-thread pin. Tapered pins are a habit, not an advantage.